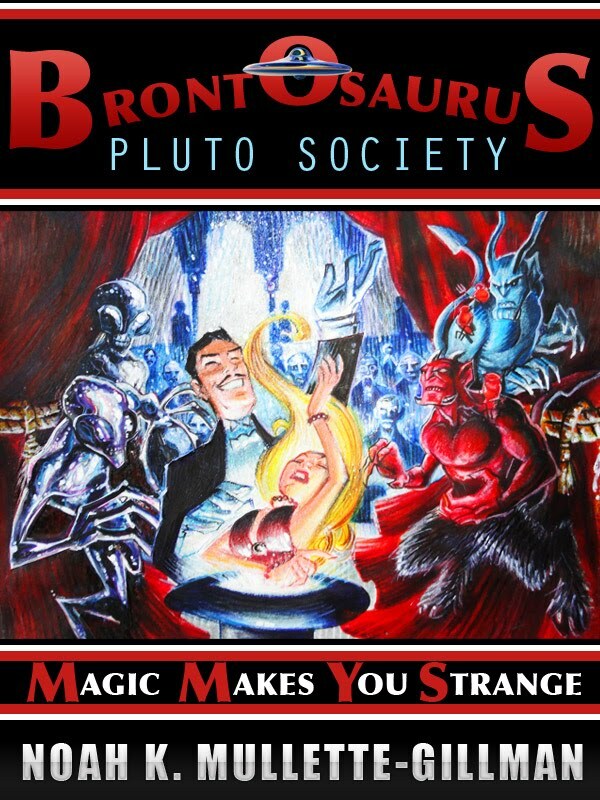 Noah K. Mullette-Gillman latest book, The Brontosaurus Pluto Society: Magic Makes You Strange, is a delightful journey into the world of science fiction and wizardry, settingthe stage for what I can only hope is a series of books about the Brontosaurus Pluto Society, and the bizarre, but recognizable world the author has crafted. Edward Whistman is the sole apprentice to renown magician, Nevil Dever, and has followed him for years, learning bits and pieces of his magic, but never really grasping the reality of Nevil secret. A dark secret that attracts the attention of aliens, and lands Edward onboard a spaceship headed toward Pluto. Confused, indignant, and slightly resourceful, Whistman defies the aliens with some otherworldly help, and returns to earth…many years in the future. And so the hunt for Whistman begins, and the Plutonians are not the only group hot on his trail. Left with a single spell by his otherworldly accomplice, Edward starts to understand the true nature of magic, and the consequences it can wreak upon everyone, including the caster. The author has created a fascinating world, with complex, well drawn characters and dangerous, beautifully crafted settings. The story is fast paced, well-constructed…and wonderfully strange. Noah’s story has the potential to extend into a successful series, appealing to young adult readers and adults alike. I look forward to the second installment of his story. Strange title, fantastic concept and story. Thank you so much, Steven. This means quite a bit to me, coming from you. I hope to have the sequel out this fall.